Heading for the Isle of Lewis! This morning a group of thirteen operators will be heading off to the Isle of Lewis via Fort William during our travels you will be able to track us on APRS but also we’ll be operating HF mobile while on route (Recommend watching the DX Cluster and Twitter). We should arrive on the Island on Saturday the 26th and be on air soon after, we will be covering the HF bands with five simultaneous stations, while the 6m & 4m stations will have a great take-off towards the UK and Europe from the island’s northern tip in IO68 square. All stations will be able to run at the full UK power limit. Satellite operations on 2m & 70cm will use X-Quad antennas and a fully automatic Az/El tracking system. A number of the group hope to make an extra trip to operate as GS6PYE/P from the Shiant Isles (EU-112). They are aiming for afternoon/early evening operations on 28 April, but may switch to 30 April if the weather is bad. We will be doing our best to share as much information as possible about the operation on the blog, but also Twitter (#Lewis2014), Facebook and Youtube. I’d recommend if you’d like to try a sked that you try request satellite passes from Sunday the 27th onwards, clearly its dependant on someone being available but we’ll do our best to make sure someone’s available. You can request satellite skeds by either emailing us at skeds-2014@camb-hams.com or sending @2e0sql a tweet. We will do our best to tweet which passes we will be on. 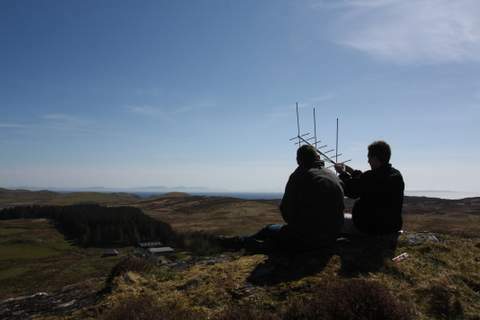 This year we have decided to improve upon our satellite operations from the Isle of Lewis, the original plan was to use a simple setup of a Yaesu FT-817 and a Arrow satellite yagi – although this setup works amazingly well as we proved last year on the Isle of Mull it does have the downside of making you stand outside in all weathers, and this year we are further north! So this year we plan to trial Bob G1SAA’s satellite equipment from the island, the new station comprises Wimo X-Quads for 2m and 70cms with SSB electronic Preamps (SP-2000/SP-7000) and a Yaesu G-5400B Az/EL rotator supported on a speaker stand. Inside the shack we’ll be using a Foxdelta ST-2 tracker (LVB Clone) connected to the rotator & ICOM IC-910 transceiver, this will all be controlled using a laptop running SatPC32. All bar one of these are SSB/CW transponder satellites, see the AMSAT guide on linear transponder operating if you are unfamiliar with it, although our main focus will be SSB QSOs we can probably do CW as well however we’d recommend that you send in a sked, or ask on hf, so that we can make sure a suitable operator is available. Of course if any other satellites with transponders become available we’ll of course endeavour to use those as well. And I’m sure you’ll still hear us using our Yaesu FT-817s and a Arrow satellite yagis if the weather is nice. Here is the outside view from next to the cottage. This lightweight setup allows flexibility in operating locations, but most of all its reliable and known to work on previous portable trips. The Yaesu FT-817 allows us to operate in semi-duplex mode which means we can’t hear ourselves on the downlink, so we plan to operate on the central part of the transponders if its an SSB satellite so we should be easy to find. We are however planning on experimenting with using a Funcube Dongle Pro Plus as an additional receiver which might help us work full duplex better, but is weather dependant. 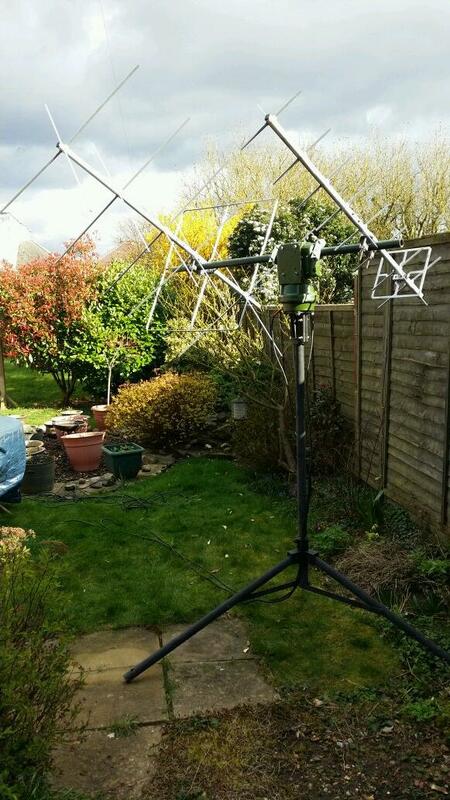 If you’re not familiar with the superb Arrow Antennas Arrow II 146/437-10 – then it is a 3 Elements for 2 Meters crossed with 7 Elements for 70 cm yagi which is easy to hold in your hand and manually track the satellite as it passes over the horizon, they also have an option for split booms and a built in duplexer this is the version we will be using. For tracking passes its likely that we shall be using the fantastic HamSatDroid designed for Android devices, and possibly SatPC32 for general monitoring and timing passes. We’ve been already asked about skeds with stations in North America and we’ll do our best to get on some westerly passes but its highly dependant on the surrounding area. If you’d like to work us we will try and announce passes we are on via the @G3PYE twitter account if we have access to the internet. This afternoon we made our first satellite QSOs, 2M0SQL (operating the radio), MM0VFC (Antenna Rotator), MM0LCM (Camera Man) went up the hill by the cottage with a clear take off all around. Using a FT-817 and Arrow antenna we were able to work two stations EA1JM and OM3WAN via AO-27 and hope to be on a few other passes during today and tomorrow. Steve and Dom have reported that they survived the first night on Lunga although it was a very wet and windy and they’re down to one radio due to a tent leak during the night. Update: Pleased to report that the radio survived its soak test! M1DST made a video and uploaded it to YFrog of Rob M0VFC operating GS3PYE/P on 40m after finishing building this brand new K3. Today, I modified the other three modules and plan to check them out tomorrow or Monday. I then have to look at producing two pairs of “two in to one” RF splitters and combiners from the pair of “four in to one” units that came with the original 1500W 4-bay amplifier. Watch this space for progress. The 10GHz system has been checked out in the workshop and is ready to air test. Currently it is sitting on a tripod in my garage. The current plan is to take it out in Flossie next Saturday lunchtime and run it up on air. To this end, we need two runs of RG58, one BNC to BNC and one BNC to N plus enough decent 12V cable to go from the van to the top of the mast to ensure that we still have at least 13 Volts up top when it’s taking 10 Amps. We have already been asked for 10GHz skeds by stations in three DXCC call areas, with promises of activity from G, GM and GI, all this before we’ve done any publicity in the Microwave fraternity. Contact john@g4bao.com if you would like to arrange a sked on 10GHz. Talk back will be on 144.185MHz and Internet permitting, via ON4KST. On Wednesday night Steve (2E0SPF) in Gloucestershire made a recording of GS3PYE/P on 80m SSB Wednesday night, we rather like the s-meter reading!